Sorry for the long delay although I am sure most of you aren’t anxiously awaiting the results of my first half marathon. After I finished there was beers, an ice bath, a nap and more beers so I’ve not had much time to post. The whole weekend was a bit of a whirlwind it seems. Let’s start with Friday’s Little Kings One Mile. Whoever decided to have Flying Pig weekend during the same weekend as home Cincinnati Reds games was out of their mind. I’m sure this wasn’t the plan but oh my god, the traffic. It was a mad dash for me to get my bib (which they were only handing out the night of the Little Kings Race), rush home so that I could get a ride to the start with my Mom and her boyfriend and make it in time to actually run with my wave. Needless to say, I made it by with only about 10 minutes to spare and I absolutely hate rushing so I ended up running with B wave instead of A because I felt like I needed the extra 10 minutes of breathing time to calm down from rushing around for an hour. I wanted to be under 8:00 for the mile, last year I did it in 8:31. I came in at 8:03. UGH. THREE SECONDS. Fine, I’ll take it. Saturday was uneventful, I was kind of tired from Friday night because I stayed out later than I wanted and also stayed somewhere else other than my own bed that night (long story). So I spent most of Saturday taking off and on naps and just resting up, I ate dinner at about 6:00pm or so, just some pasta with alfredo sauce and was in bed by 8:30pm. I slept probably from 9:30 or so until 2:15 when I woke up thinking it was almost time for my alarm to go off but had a solid hour or so till I needed to be up so was able to fall back asleep till my alarm went off. I got up, showered, ate my breakfast and got dressed. I brought an old hoodie with me that I thought I might need to wear at the start just to make sure I wasn’t shivering but when I walked out of my house it was surprisingly pleasant. I should have known that this probably wasn’t a good sign, I spent 4 months training for this race in freezing or below freezing temperatures. I’m not sure what to expect when it starts getting warm out. Getting over to the race wasn’t bad, we met up with other runners and coaches, my coach too at the store and walked across the bridge to get to the race. That was probably a solid mile walk to get from the store to our corral and I was sweating (either from nerves, the heat or both) by the time we got into the corral. We used the port-a-potty’s to go to the restroom one last time and by the time we were all finished the crowd in front of us started walking and we were on our way. It was a LONG time before we finally saw the start but we crossed it and got to running. I basically followed my coaches lead, I figured she’s coached us all winter long, she’s done this before, she knows what she’s doing. But mile 3 I felt like we were REALLY cruising, going WAY, WAY faster than we should have been but I trusted that maybe I just FELT like it was fast but we were really going about our normal pace. I still to this day don’t know what our splits were on those first 3 miles but it would not surprise me if we were running a whole hell of a lot quicker than normal. I really didn’t want to lose my group so instead of slowing down, I just kept it up and that came back to bite me REAL hard on the hills. 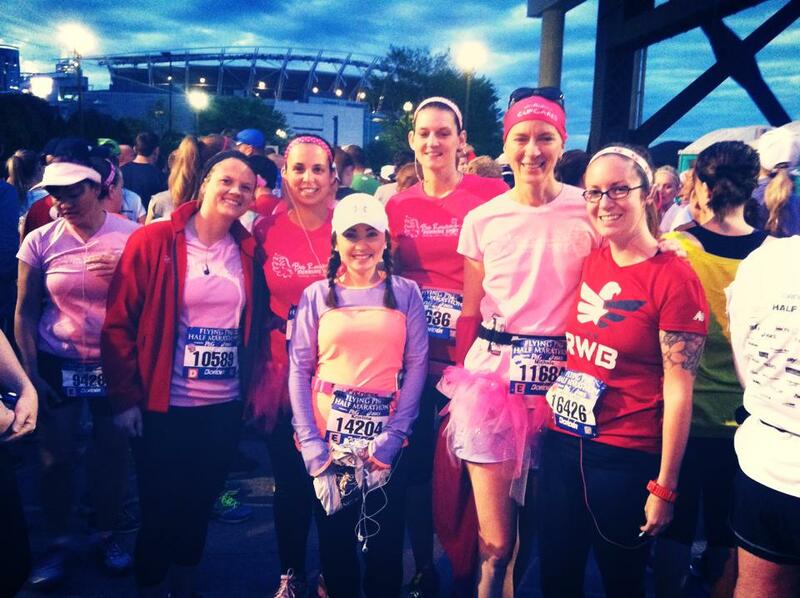 If anyone knows anything about the Flying Pig, you know the 6-9 miles are nothing but hills. You get a little bit of a break but it’s mostly a straight shot up one hill, to another hill, to another hill. I’ve trained these hills for MONTHS, I’ve ran them numerous times, up, down but I bonked. I bonked hard. I made it most of the way up Gilbert and Eden Park but I had to walk, there was no way around it. My calves locked up and they never loosened up again. I honestly can’t even tell you how much I walked, I zoned out. I don’t know if it was a half a mile, a quarter of a mile, I don’t know. I just know that it felt like a lot of walking especially because I never walked once, ALL training long. I was pissed, I really was. I had a solid goal of coming in under 2:30 and I watched as it was slowly ticking away. Lesson learned, trust yourself, if you think you are going out too quick, slow down. Still going strong although I didn’t feel real strong! Needless to say from about 6.8 miles on was rough, I just felt like I was gassed. I was really disappointed in myself, people I knew kept passing me telling me to keep it up and I tried but I was just shot. I finished the last 3 or so miles pretty strong and I came across the finish line at 2:37:16. 7 minutes over my max time goal I had for myself. Post race beers tasted fantastic! I know I shouldn’t beat myself up over it. It happens. It was my first half marathon so whatever the time is, is a PR for me but I was just expecting a lot more out of myself. It made me feel better that the girls I was running with were also struggling, having to walk when they hadn’t walked all training long. That to me says that we likely all went out too quick and just got gassed by the mid-way point. You have some good runs, you have some crappy ones. I do have about 4 more halfs that I’ve registered for (that are mostly flat) and I hope to PR and prove to myself that I can do better if I watch my time in the beginning. We don’t clean up too bad after a race, huh? Congrats on your first half! First races are so exciting, but also such a learning experience. From getting up super early to the crowds to not having stop light breaks, conditions are a lot different than training runs. I’m sure that you’ll be able to hit your 2:30 goal time in your next race. What other races are you signed up for? Thanks!! I am signed up for Dublin, Ireland Rock N’ Roll Half, Air Force Half, Indy Half. Might be going to Milwaukee in June for a half up there as well but haven’t registered yet. Wow…Dublin sounds amazing! I’m still trying to decide what half I want to run this fall. Congrats on the first half!! Congratulations on your first half! 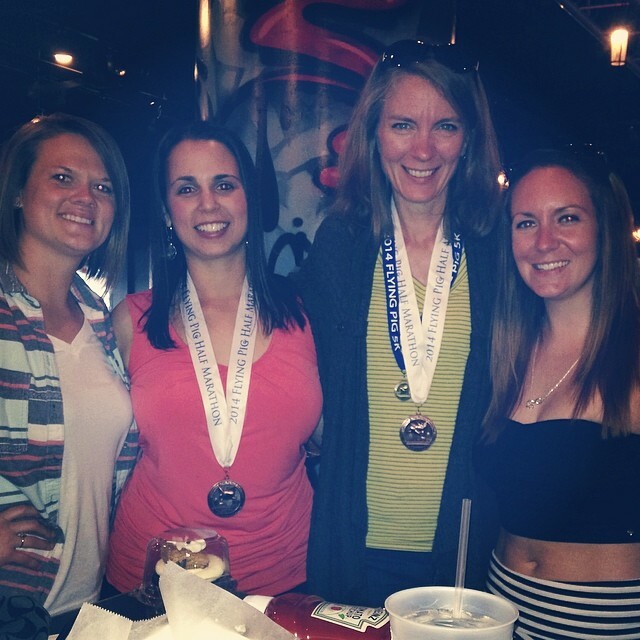 One of my really good friends ran the Flying Pig relay and I heard about those hills. That course is TOUGH! I think you did GREAT! Awe thanks!! Yes, the hills! Ugh, the hills! I’ve lived in Cincinnati my entire life and didn’t know until recently how freakin’ hilly it is here!! I can’t wait to post about Ireland, I hope to be able to blog while I am over there as I will need my laptop anyway because I’m taking some courses for college this summer online, ughh! Not too be creepy, but I was looking for your recap yesterday! haha. Kathleen wants to do this half so I was looking forward to hearing about it. 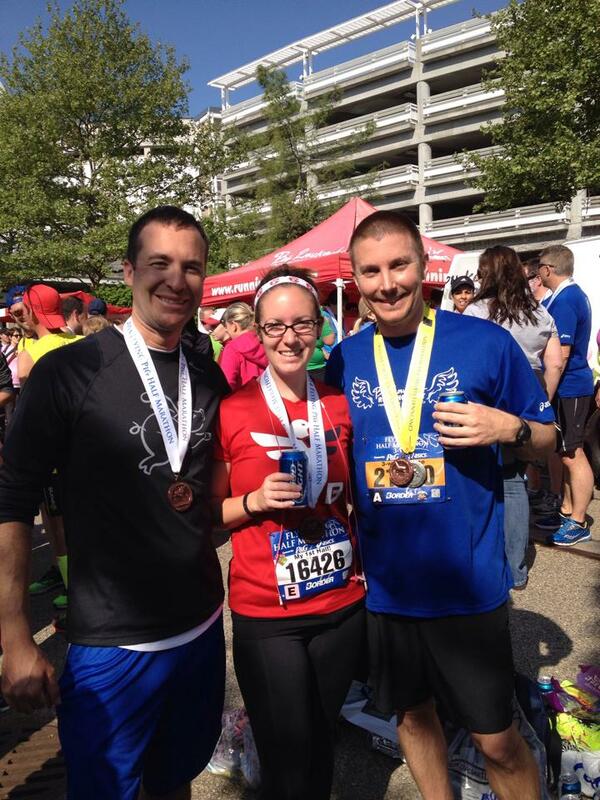 Congrats on your first half marathon! I still have problems coming off too fast and not have energy later, but you will become a pro by the end of the year with all the half’s you have lined up. Great job! Haha! Well that makes me feel good that someone was interested in knowing how it went! It’s a great half, it really is. There are some serious hills but it’s awesome. The spectators that come out are unreal and the expo is one of the best. Congrats on your first half!! I think you’ll easily get a new PR with one of your upcoming races. Dublin will be so awesome! 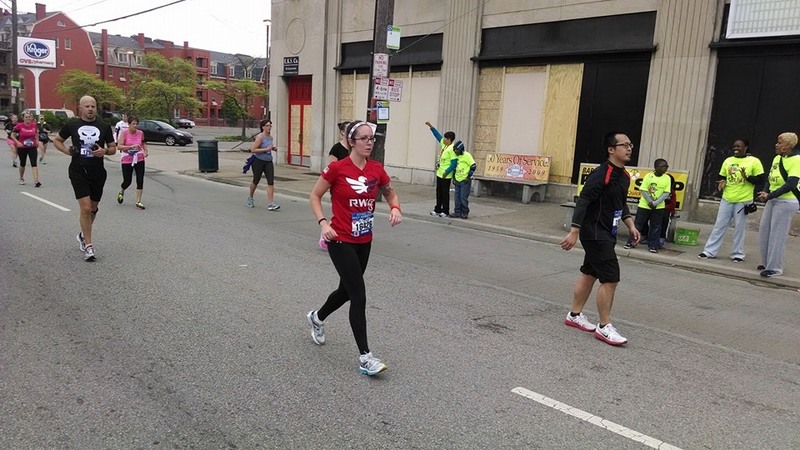 Congrats on your first half – and your PR! First races are such a weird experience. For me it was nothing like I imagined and went by in a blur! But it looks as if you’ve caught the running bug and you’ll only get faster! My next half marathon is in August in Dublin, Ireland. I don’t think I have any smaller ones in between now and then. ← We made it through winter!